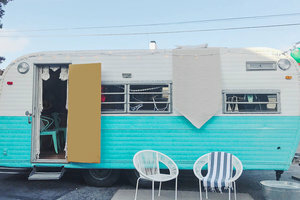 This truly unique 17' renovated vintage Yankee Clipper is a one-of-a-kind space for pop up shops, photo/video shoots and events. The space is located at Woodland Hills with the option to move to Great Spirits Rand in Malibu Canyon at an additional price. White and turquoise exterior with all birch wood interior and wood look flooring. There is wall hanging and counter top space and an open format. 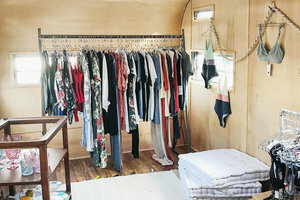 The space also offers the use of garment racks, furniture and decor. This is an exceptional opportunity for startups and brands to break the mould and host a destination pop-up event.